It was made Korea Web Accessibility Group by some of expert s of web standards. It had several meeting to study web accessibility from September, 2006. 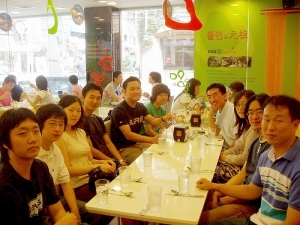 Hooney, one of the participants proposed a name of this group: KWAG, Korea Web Accessibility Group. They shared and studied together in the following fields: history of web, the benefits of web standards, the components of web standards, multimedia accessibility, SMIL, multi-modality, usability, workflow, Flash accessibility, browser interoperability, coding techniques, authoring tools, e-learning accessibility, accessibility guidelines, assistive technologies, screen readers, plug-in problems, etc. You can join and together with them to write KWAG.